Winter is Coming, and if you are like us, you have eagerly be waiting for this day to come! Today is the season premier for Game of Thrones! We are all obsessed and avid watchers, and to pay our respects, the DT has thrown together a MINI hop for the premier later today! To be eligible to receive the files showcased throughout this blog hop, you MUST follow the guides below. Failure to do so may warrant you NOT getting any files! There are 5 in total. 2- Leave a comment on each blog to show some love for the inspiration you have just seen! Remember 5 stops, so that means 5 comments in total! Jon Snow and Ghost Treat Bag!! My favorite Game of Thrones character, I also used the A2 Landscape Card Bag. Sentiment is from Jaded Blossom's Knight Bites and the label is from their Flag Die and Flag Die 2 sets. No problem.... here is the complete blog line up for you! Well, maybe this is my favourite .....thankyou! Love this hop for my favorite show! Great card! I love this, such great detail in his hair and his eyes! Great job!!! Very cool love how you did the hair !!! awesome treat !! Jon Snow is my favorite! Love the background and color. Winter is coming. Love how you did his eyes! Love your treat bag, I'd like some royal treats please! I love the idea of a treat pocket card, and your wine tag is awesome. Just loving it especially the hair! Great treat box! Love all the detailing you did with Jon Snow! John Snow is one of my favorites! Great job, Brigit!! This is really really nice work. Holy Moly! Jon is awesome! What a phenomenal job on this project. WoW! Wow, what an amazing job on the hair, and then entire coloring!! I love the treat bag and the colors that you chose are spectacular! Great project! Love the hair. I love how you used an actual photo in the background. This is an awesome project all around. Nice job! How awesome is that! from the back ground to the charter. Johns Snow is one of our favorites! The background photo is a nice touch. Who doesn't love Jon Snow? Great treat bag. love the bag! great idea! This treat bag is super adorable!!! Love your card. The background is awesome. Wow! The coloring and background on your project is phenomenal! Awesome project. This is AMAZING ! Thank you. very cute snow and ghost!!! you did a great job. Ohhh Love this one too!! Awesome job this is really great. Love the way you did the hair. Love this card. Great background. You did a terrific job. Wow! Awesome job Brigit!!! Love your project! So cool! Love Jon, the texture of his hair, looks like he is cover with snow. I love the treat bag!!! Jon Snow is my favorite! I love your project! This is a cool project! Thanks for sharing! Jon snow I loved him with the red head I love your card! Look at those details! I love it!! Very cool hair! Love it! This is such a cute gift bag. I love how you have colored his hair, it so cool! Wow the detail in your card is awesome. I really like your creativity here. This is just so detailed. Wow. Beautiful scene. The guy looks magical. Yea, I would consider Jon Snow a treat!LOL Awesome job! The cat is really cute. Jon Snow and Ghost!! Great treat bag. You all just make me want to craft but you all are so fabulous at it. Every single project you all make is perfect. Can't wait to see GOT tonight! Such a wonderful gift bag! Jon is one of my favorites. I have a list of 4 that I say better not die. 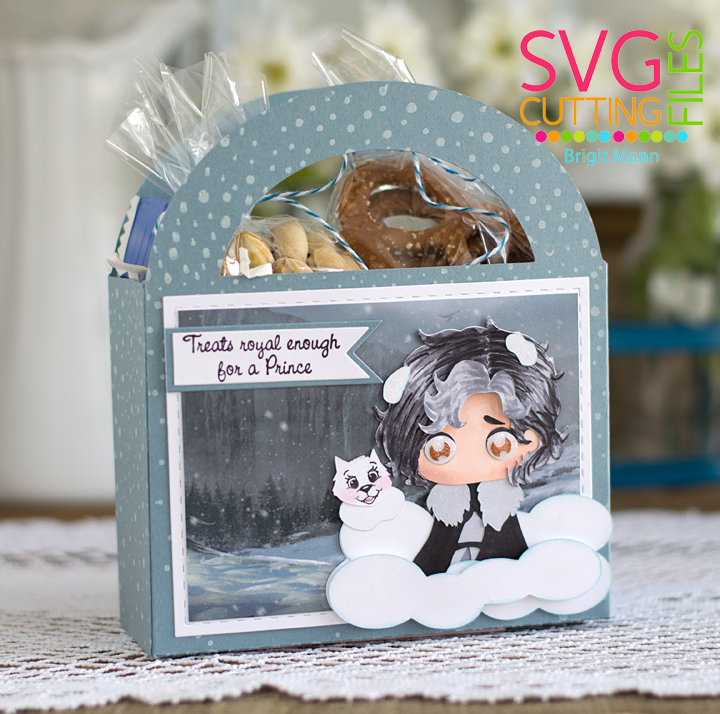 Very cute project like that you included Ghost! Wow this is awesome everything is so perfectly coordinated and love the dimension too! Can' wait to try these! Love the shading on the hair. Awesome. I love the background you used for your bag. Love the treat bag! Fantastic job. Wow, your treat box is just so awesome, love the colors and the sentiment. Love love love Jon Snow!!! This hop is making me want to watch this series! Wow, what a Super Cute Goodie Bag!!! This came out really cool. Love Jon Snow! Awesome job!! Who doesn't love John Snow! Very nice! Love what you did with the card bag! I love John Snow! Great project! TFS! Jon Snow!! Love how he buried. Jon Snow is my favorite! Heck, I'm even married to a Jon Snow(den). Ha! I love this Jon Snow file. TFS. :-( I can't get the photo to load. WOW. This is absolutely amazing from the background to the hair. Thanks for the hop, this is so fun. Love the treat box! Thanks for sharing your terrific treat box. Love your treat box! The hair is awesome. So stinking awesome!!! :) Love it! Ghost is pretty darn cute. Brigit - your project is the absolute bomb..
Great idea to use a real photo. Lovely project. Wow! Great hair!!! Love the eyebrow too ;-) Awesome treat box! My hubby would love this! Great treat bag! Love your coloring. I love Jon Snow! Great job!